The Resp-O-Rator has no straps, weighs only 7 ounces, makes no noise and can be worn with safety goggles, face shields, beards and hearing protectors without interference. To put it on, pull the tube out of one side of the front, slip it over your head and slip the tube back together. The two filters are located behind the user where the air is cleaner to begin with and remove 99.97% of particles down to 0.3 microns! The mouthpiece fits comfortably between the lips and teeth. When you exhale the exhaust is directed downward so goggles or a face shield being worn will not fog. 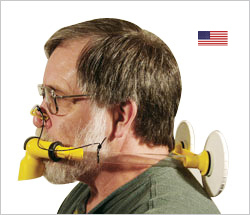 A nose clip is included for those who want to completely remove the possibility of inhaling through the nose. It will protect the wearer from particulate dust without the usual drawbacks of dust masks. The Resp-o-rator Jr. is a smaller, less expensive version of the Resp-o-rator that is great for lower intensity situations involving nuisance dust. It uses one filter to remove 97% of particles down to 0.3 microns in size. The mouthpiece is held between your lips and teeth and the nose clip is used like one for swimming, The Resp-o-rator Jr is great for sanding and when using woods that create more dust than shavings. It is also great for use outside while weed eating and mowing the lawn for people with allergies. The Resp-o-rator Jr. uses the same replacement mouth pieces and filters as the original Resp-o-rator.